avajānanti—deride; mām—Me; mūḍhāḥ—foolish men; mānuṣīm—in a human form; tanum—body; āśritam—assuming; param—transcendental; bhāvam—nature; ajānantaḥ—not knowing; mama—Mine; bhūta—everything that be; maheśvaram—supreme proprietor. "Fools deride Me when I descend in human form." From the other explanations of the previous verses in this chapter, it is clear that the Supreme Personality of Godhead, although appearing like a human being, is not a common man. The Personality of Godhead, who conducts the creation, maintenance and annihilation of the complete cosmic manifestation, cannot be a human being. Yet there are many foolish men who consider Kṛṣṇa to be merely a powerful man and nothing more. Actually, He is the original Supreme Personality, as is confirmed in the Brahma-saṁhitā (iśvaraḥ paramaḥ kṛsṇaḥ); He is the Supreme Lord. There are many īśvaras, controllers, and one appears greater than another. In the ordinary management of affairs in the material world, we find some official or director, and above him there is a secretary, and above him a minister, and above him a president. Each of them is a controller, but one is controlled by another. In the Brahma-saṁhitā it is said that Kṛṣṇa is the supreme controller; there are many controllers undoubtedly both in the material and spiritual world, but Kṛṣṇa is the supreme controller (īśvaraḥ paramaḥ kṛṣṇaḥ), and His body is sac-cid-ānanda, non-material. Material bodies cannot perform the wonderful acts described in previous verses. His body is eternal, blissful and full of knowledge. Although He is not a common man, the foolish deride Him and consider Him to be a man. His body is called here mānuṣīm because He is acting just like a man, a friend of Arjuna's, a politician involved in the Battle of Kurukṣetra. In so many ways He is acting just like an ordinary man, but actually His body is sac-cid-ānanda-vigraha-eternal bliss and knowledge absolute. This is confirmed in the Vedic language also (sac-cid-ānanda-rūpāya kṛṣṇāya): "I offer my obeisances unto the Supreme Personality of Godhead, Kṛṣṇa, who is the eternal blissful form of knowledge." There are other descriptions in the Vedic language also. 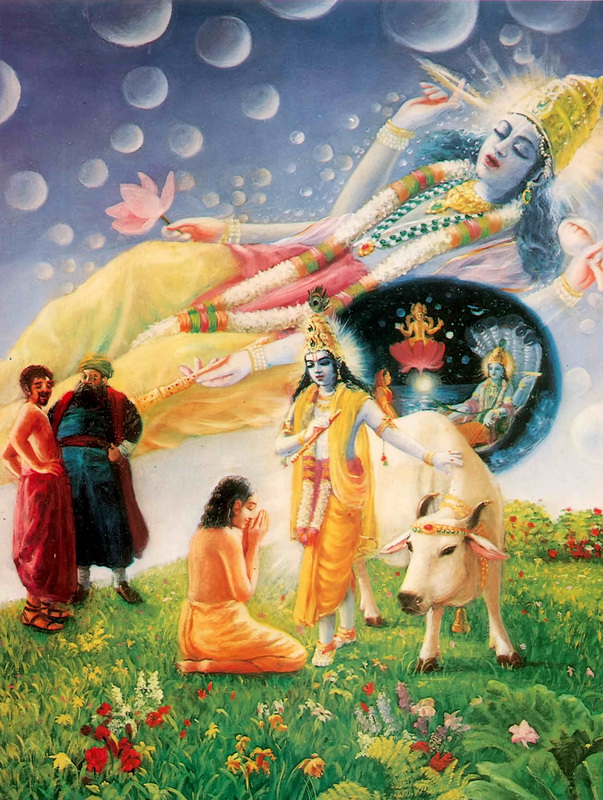 Tam ekaṁ govindam: "You are Govinda, the pleasure of the senses and the cows." Sac-cid-ānanda-vigraham: "And Your form is transcendental, full of knowledge, bliss and eternality." Despite the transcendental qualities of Lord Kṛṣṇa's body, its full bliss and knowledge, there are many so-called scholars and commentators of Bhagavad-gītā who deride Kṛṣṇa as an ordinary man. The scholar may be born an extraordinary man due to his previous good work, but this conception of Śrī Kṛṣṇa is due to a poor fund of knowledge. Therefore he is called mūḍha, for only foolish persons consider Kṛṣṇa to be an ordinary human being because they do not know the confidential activities of the Supreme Lord and His different energies. They do not know that Kṛṣṇa's body is a symbol of complete knowledge and bliss, that He is the proprietor of everything that be and that He can award liberation to anyone. Because they do not know that Kṛṣṇa has so many transcendental qualifications, they deride Him. There are many controversies amongst the impersonalists and the personalists about the Lord's appearance as a human being. But if we consult Bhagavad-gītā and Śrīmad-Bhāgavatam, the authoritative texts for understanding the science of Kṛṣṇa, then we can understand that Kṛṣṇa is the Supreme Personality of Godhead. He is not an ordinary man, although He appeared on this earth as an ordinary human. In the Śrīmad-Bhāgavatam, First Canto, First Chapter, when the sages inquire about the activities of Kṛṣṇa, it is stated that His appearance as a man bewilders the foolish. No human being could perform the wonderful acts that Kṛṣṇa performed while He was present on this earth. When Kṛṣṇa appeared before His father and mother, Vasudeva and Devakī, He appeared with four hands, but after the prayers of the parents, He transformed Himself into an ordinary child. His appearance as an ordinary human being is one of the features of His transcendental body. In the Eleventh Chapter of the Gītā also it is stated, tenaiva rūpeṇa etc. Arjuna prayed to see again that form of four hands, and when Kṛṣṇa was thus petitioned by Arjuna, He again assumed His original form. All these different features of the Supreme Lord are certainly not those of an ordinary human being. Some of those who deride Kṛṣṇa, who are infected with the Māyāvādī philosophy, quote the following verse from the Śrīmad-Bhāgavatam to prove that Kṛṣṇa is just an ordinary man: ahaṁ sarveṣu bhūteṣu bhūtātmāvasthitaḥ sadā: "The Supreme is present in every living entity." (Bhāg. 3.29.21) We should better take note of this particular verse from the Vaiṣṇava ācāryas like Jīva Gosvāmī instead of following the interpretation of unauthorized persons who deride Kṛṣṇa. Jīva Gosvāmī, commenting on this verse, says that Kṛṣṇa, in His plenary expansion as Paramātmā, is situated in the moving and the nonmoving entities as the Supersoul, so any neophyte devotee who simply gives his attention to the arca-mūrti, the form of the Supreme Lord in the temple, and does not respect other living entities is uselessly worshiping the form of the Lord in the temple. There are three kinds of devotees of the Lord, and the neophyte is in the lowest stage. The neophyte devotee gives more attention to the Deity in the temple than to other devotees, so Jīva Gosvāmī warns that this sort of mentality should be corrected. A devotee should see that Kṛṣṇa is present in everyone's heart as Paramātmā; therefore every body is the embodiment or the temple of the Supreme Lord, and as such, as one offers respect to the temple of the Lord, he should similarly properly respect each and every body in whom the Paramātmā dwells. Everyone should therefore be given proper respect and should not be neglected. There are also many impersonalists who deride temple worship. They say that since God is everywhere, why should one restrict himself to temple worship? But if God is everywhere, is He not in the temple or in the Deity? Although the personalist and the impersonalist will fight with one another perpetually, a perfect devotee in Kṛṣṇa consciousness knows that although Kṛṣṇa is the Supreme Personality, He is all-pervading, as is confirmed in the Brahma-saṁhitā. Although His personal abode is Goloka Vṛndāvana and He is always staying there, still, by His different manifestations of energy and by His plenary expansion, He is present everywhere in all parts of the material and spiritual creation.